All warranty issues or concerns must be supplied to Assiniboine using our Warranty Request Form. Assiniboine will be in touch the next available business day to review this issue. Utilities: If utility lines are located close to any necessary excavation and hand removal is required there may be an additional charge. Contact your estimator or project manager if you think this may be an issue. All patios are covered against any major shifting or settling for 2 years, it is the intention during construction to expect up to 1” of settlement over the patio life. Patios can sink if water is continuously dripping on it in the same place, Assiniboine is not responsible for this type of damage due to neglect, but we can fix it at a far price. If polymer sand is used in the patios, Assiniboine is not responsible for any ‘staining’ that may be a result of the application, some product is slightly defective and can cause a ‘greying’ of the stones. Every year it is a good idea to sweep sand into patios where the sand has settled. Ask us to leave some extra polymer sand which is easily applied or call us to apply it for you, free of charge for the first 2 years. All retaining walls are covered against any major heaving or sinking for 2 years. Assiniboine builds drainage into all major walls to prevent heaving, this is extremely robust, however you cannot have excessive amounts of water behind the wall, if a drain spout or leaking hose is behind the wall it must be relocated or warranty is void. Stackstone is only recommended as a decorative wall product and Assiniboine cannot be responsible for any walls constructed with Stackstone that are supporting significant mass (mounded beds or patios) and / or are over 18” in height. All woodwork is covered from any major structural defects for 2 years. All wood dries once it is installed, 99% there are no problems, however sometimes the wood can twist and crack. Assiniboine is not responsible for this naturally occurring phenomenon, however if some of the wood does dry poorly, call us and we will usually provide 1 complimentary warranty call to replace the affected pieces. 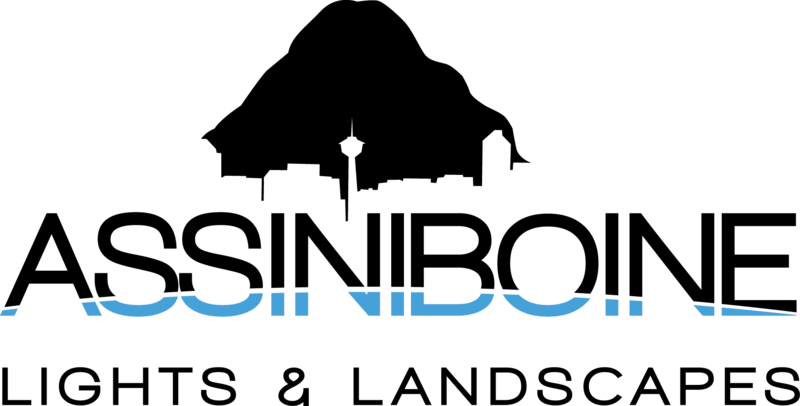 All wood products weather naturally – pressure treated / composites will fade and cedar will silver, Assiniboine is not responsible for regular maintenance / staining after construction. Deck estimates do not include verticals (fascia, stair risers or skirting) unless specifically stated. Ask your estimator or project manager about pricing. Cracks in Natural Wood Products - Natural wood products like cedar and pressure treated lumber do naturally crack and shrink as they dry and are exposed to the elements. Assiniboine cannot warranty natural cracking, if you are concerned please give us a call to discuss. All parts and labor have a 2 year warranty. The irrigation system must be blown out before the first freeze in the fall. All zones must be shut off for the winter. The water main must be turned off for the winter. The system must be started in the spring and all heads and drip lines must be checked for alignment. Mulch biodegrades every year. You must add new mulch every second year due to this process. Call us anytime and we can easily and cheaply bring you some additional mulch to top off and freshen up your gardens. Weed barrier is not a permanent solution for weeds. It only REDUCES the presence of weeds. You must ensure no one is ripping or digging in the barrier. In order for the weed barrier (4.5 oz fabric) to be effective, any organic matter on top of the barrier must be removed, as weeds will grow in organic matter on top of an effective barrier if not properly maintained. A regime of weed control products or manual weeding is the only way to prevent weeds. Please read the weed control products instructions before application. When a maintenance free area is being planned in a previously weed infested area, or bordering a weedy area the homeowner should do their best to eliminate the worst of the weeds prior to construction in order to ensure the best chance of weed elimination. Please click here to read our Sod Care Instructions and Shrubs, Perennials and Trees Instructions. Sod Care Instructions: Your new sod will take 3-5 weeks to establish before you can cut it. You must water the sod 2 times a day for the first 2 weeks for 15 minutes each time. If it is drying out, increase the duration. YOU CANNOT WALK ON WET SOD! You’ll create ‘sinking footsteps’. After 2 weeks, water every day for an additional 4 weeks. Once the sod is being cut, water every second day for 15 minutes. Cut on a higher lawn mower setting for the first summer, to prevent burning. Fertilize at the end of the summer. You should cut your lawn once per week and cut it at about 3 inches. Browning - If there is minor browning in certain areas, continue to water heavily once the grass is rooted and healthy the green will take over. This will primarily occur where the lawn butts up directly against trees, cement, houses, buildings. If the odd piece of sod doesn’t take or if browning continues, give us a call and we will likely provide a complementary service call to fix affected areas, if all instructions have been followed. Do to the variable conditions of the Canadian climate, and our inability to insure that planted greenery gets the proper care Assiniboine can not provide a warranty on any plants or trees. Shrubs, perennials and trees do not have nursery warranty, in the event that they do have a warranty, it does not cover delivery and labor. Shrubs, Perennials and Trees Instructions: Your new shrubs, perennials and trees will take 2-4 weeks to establish roots and a healthy grow pattern. You must water the shrubs and perennials once per day for the first 2 weeks, 1 gallon of water per shrub and 1 liter per perennial. If they are drying out, increase the amount. After 2 weeks water every second day for the remainder of the summer. In the fall cut back the perennials and prune the shrubs. Fertilize in the spring with a shrub or perennial fertilizer. A certified arborist must prune your trees every second year. Note - Over-watering is the #1 cause of Tree Death, especially during the first month after planting. Repairs will extend to the cost of the affected area, but will not cover damage caused as a result of the failed area. For example, if a wall falls and damages shrubs/perennials, Assiniboine is responsible for fixing the wall, but not for replacing damaged shrubs/perennial. Assiniboine can not be held responsible for damage caused to landscapes by acts of nature or 3rd party damage. All landscapes are constructed to endure typical conditions, but can not be expected to withstand extreme flooding, tornados, fire or damage caused by others such as cars crashes and vandalism. Assiniboine can not be held responsible for damage to underground sprinklers or lighting that are not properly marked. 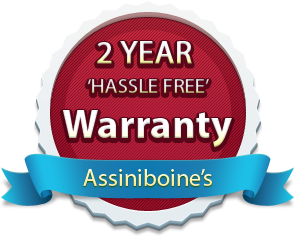 Assiniboine will provide a maximum of 2 complimentary warranty calls pertaining to the same issue during the 2 years.